If you have attended a rug training course, odds are the Ardabil Carpet was briefly discussed. It is very interesting how a 500-year-old rug and its twin have survived the centuries to remain in reasonably good condition. The current homes of these rugs are the Victoria and Albert Museum, London (V&A) and the Los Angeles County Museum of Art (LACMA). It took a long road of intrigue, earthquakes, multimillionaires and characters who were “extremely economical with the truth” for them to arrive at their current homes. In 1539, a pair of rugs (also referred to as carpets) were woven for the Ardabil Shrine of the tombs of Sheikh Safi and Shah Ismail in northwest Iran. They are known today as the Ardabil Carpets. They were placed side by side in the shrine (Image I). At that time the carpets were woven, the Safavid royal court was located in Tabriz which is most likely where the weaving took place. 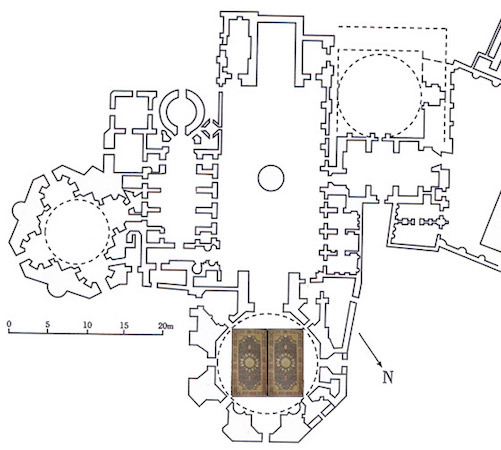 The Ardabil carpets are covered by a single, integrated design (Image II), and are very large – about 34’6” by 17’6” when originally woven (Image III). The rugs have a wool pile on a silk foundation, with 324 to 380 knots per square inch. This means the original rugs had almost 34 millions knots each. It would have taken a team of weavers 3 to 4 years to complete each rug. Research has shown the rugs were woven at the same time from the same dye lots of wool, as evidenced by identical areas of abrash. It would be impossible today to recreate such majestic rugs. In 1882, an earthquake caused the roof of the shrine to collapse, damaging the rugs. The rugs were then purchased by Ziegler & Co., a Manchester, UK firm involved in the carpet trade. The pair of rugs was moved from Iran to Istanbul, where one rug was used for extensive repair on the other. The result was one “complete” carpet and one with no border. The smaller carpet, housed at LACMA, is 23’11” by 13’5”. Certain scraps from the repair are now in museums in Europe. In 1892, the larger carpet was put on sale by Vincent Robinson & Co. of London. The designer William Morris went to inspect it on behalf of the V&A Museum. Reporting that the carpet was “of singular perfection…logically and consistently beautiful,” he urged the museum to buy it. The money was raised, and in March 1893 the museum acquired the carpet for £2000. Its value today would be about $2,000,000. The second, smaller carpet was sold secretly to an American collector with the understanding that it was to leave England. The museum was told only one Ardabil Carpet existed – which certainly increased its value. 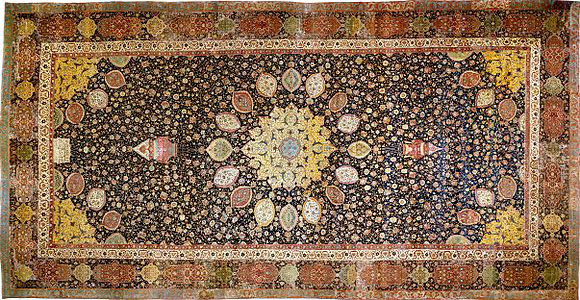 The smaller carpet (Image IV) exchanged hands by wealthy buyers over the years before ending up in the New York apartment of John Paul Getty. He donated the rug to LACMA in 1953. The London Ardabil Carpet hung on the wall in the V&A for many years. In 2006, the museum created an extraordinary case in the centre of the gallery so that the carpet could be seen as intended, on the floor. To preserve its colors, it is lit for ten minutes every half hour. The Los Angeles Ardabil Carpet is currently on display at LACMA, and was a real treat to see recently. It is only put on display from time to time. The London Ardabil is available to see year round. The last time we saw it, the rug needed a cleaning, but I am happy to report it was cleaned before going on display in the new venue. The Ardabil Carpets represent the Golden Age of Persian rug weaving. It is amazing they have survived almost 500 years. To put it in perspective, they were woven about the time Michelangelo was painting the ceiling of the Sistine Chapel. This carpet is a “must see” on your next trip to London or Los Angeles.